Award winning author Elizabeth Berg began her latest book tour by visiting Cundy's Harbor Library where director Karen Schneider hosted a discussion and intimate evening of book readings from the internationally acclaimed author. Why Cundys Harbor Library? I always say don't underestimate the power of libraries and social media to gather a community! It's the stories we tell each other that have profound impact. Today's senior leadership of the Cosmopolitan Club, President Michele Ober and Vice President Perian Moore owe their organization to a group of civic minded, enterprising young women in the early 1900's who were disatisfied with the mundane duties of daily life. So, they started a philanthropic organization conceiving the Bath Cosmopolitan Club. On April 11, 1913, it became a reality in the home of it's founder, Miss Elizabeth Webber. An autumn stroll through the streets of Boston Massachusetts yields some delightful architectural imagery. Major League Lacrosse team The Boston Cannons teamed up with National Foundation for Cancer Research (NFCR) to raise funds for cancer research right in Boston. Under a platform of Unity- from all walks of life - Scientists, the sportsminded and the tech community came together to raise money that is specifically earmarked for the laboratory of Dr. Daniel Haber in the old Charlestown Navy Yard. from the Boston Cannons Press Release: The goal of Cannons Fighting Cancer was to bring the lacrosse community together to raise funds and awareness for philanthropic and research organizations that are focused on finding a cure for cancer and providing services, support and care for individuals and families who are impacted by the disease. The Cannons honored members of the Greater Boston medical, science, philanthropic, survivor and lacrosse communities for their continuous efforts in the fight against cancer. Boston's Chinatown with great Dim Sum restaurants like Hei La Moon and interesting architecture and images. As Brunswick prepares for its bid to be The Great American Downtown, here is a cross section of images representing the lively active welcoming atmosphere across the seasons. It was Six years ago to the day, St. Patrick's Day March 17, 2008 that Joe & Pam Byrnes opened their Pub in Bath. A picture of Joe and his daughter Maggie was taken that day and here we are, six years later, on the very same spot and a new photo now exists. To Maggie, manager of the Bath pub; Patrick manager of Brunswick; Joe, Pam, family and friends...we say TO THE GUINNESS...hoist And a wonderful sixth anniversary this is! A gorgeous summer day to travel down the Cathance River by kayak. We put in at Head of the Tide in Topsham at the Brunswick Topsham Land Trust parking lot and launch site. Great location. We paddled all the way to Bowdoinham's town landing at a leisurely pace viewing Osprey, Eagles, marsh land and a very old culvert/ railroad bridge. The bridge, made from cut stone, is in better shape than more recent road construction at half its age. Amazing what was done a century ago with less advanced tools. Coastal Counties Workforce Inc held their annual meeting on June 9, 2017. CCWI is a non-profit founded to administer and oversee workforce development programs in Maine's six coastal counties of Knox, Lincoln, Waldo, Sagadahoc, Cumberland and York. More than just recognizing the training, education and employment services, the day was a celebration of the successes of real people having positive impact on members of our community. I particularly salute the partners, the WIOA Youth Participant of the Year and the PREP Participant of the Year and all those who contributed to the great strides made. It takes a village with people who care to really make community happen. That care and concern was evident in the images all around me. CommonBond Fall Firesides: The Taste of Sweet Success. An evening with David Klein and Alex Whitmore. Arriving in Cork Ireland by train from Dublin - you can see the colors and architecture that calls out to me beyond the gritty industrial rugged beauty. Texture and gray backdrops allow the bright spots to pop. University and second largest city in Ireland has an emerging cybersecurity startup cluster & real good craic - here's what I see. Will add the music night life later! 2015 is the CRYER's 30th year of publishing Good News for the Southern Midcoast Community. Started by Verdi & Margaret Tripp, the plan has consistently been to write about and bring visibility to the great things going on around us. Charlie Crosby, the current publisher, has a passion for maintaining the Cryer's fine traditions but he also has modernized & updated the paper. Today the CRYER is available online and at Boston's North Station right near the Downeaster Ticket booth. The CRYER and Maine State Music Theatre share some commonly held goals to celebrate community. Daymond John Supported a special meeting of EO Boston to help local entrepreneurs. How wonderfully exciting to participate in FRAXA's night at the Boston Bruins game, Friday March 31, 2017. Fraxa board members, families and friends joined in to celebrate the work of FRAXA http://fraxa.org/ and raise awareness and funds for research to find a cure for FRAGILE X, the most common inherited cause of autism and intellectual disabilities worldwide. A celebration of the Humanities at Manchester High School Central Induction Ceremony with special guest speaker Gloria Norris Wednesday April 12, 2017 These are photojournalist style reporting of the event. A celebration of the Humanities at Manchester High School Central Induction Ceremony with special guest speaker Gloria Norris Wednesday April 12, 2017 Most of the certificate earning honorees are pictured within this set of photos. Can be shared via social media on individual images. Downloaded for free with KeithSpiroPhoto watermark or available without watermark for small license fee Downloadable jpg. Manchester High School Central and Smyth Road School pulled together to entertain the community while raising funds for their schools. The Harlem Wizards were the perfect foil and the event was almost as much fun as faculty follies. Enjoy! We joined Harpswell Heritage Land Trust for a special annual meeting—one commemorating their 35th anniversary. From a tour of the exterior of the National Register listed 1783 Tarr-Eaton House with Deane Van Dusen to the annual meeting itself with guest speaker, acclaimed poet, Richard Blanco and finishing up with a next day paddle to Little Yarmouth Island led by Registered Maine Guide, Alicia Pulsifer Heyburn. Inspired by Katahdin is an art show that blossomed from the book Art of Katahdin by David and Carl Little. The Harlow Gallery in Hallowell Maine is hosting this show in November and December 2014 and then it moves to Sotheby's in Damariscotta for January - April 2015. Keith Spiro was inspired to create these images on an artists retreat with watercolorist Evelyn Dunphy at Frrederic Church Camp on Lake Millinocket in the shadow of Mt. Katahdin in August 2013. Katahdin Big Dipper was selected by David Little to be included in the Harlow Gallery Show. All sizes of prints are available here online from the artist. InTeahouse Holiday Tech Celebration gathered together Boston's top innovators, entrepreneurs and venture capital investors. Bringing Tea Culture international, a tea ceremony was performed and guests got a chance to mingle, collaborate and see the latest in Robotics. JOY OF THE LENS 2019 Topsham Public Library's 10th Annual Photography Exhibit Co-sponsored by the Trustees and the Friends of the Topsham Public Library Exhibit dates: April 2, 2019 through May 4, 2019 Excited to share these photos during National Library Week April 7-13, 2019. Libraries = Strong Communities! Lewiston Auburn Artwalk is turning downtown into an active arts and community destination. 6,000 kids, 300 teams, 2 day Lacrosse Festival: The New Hampshire Youth Lacrosse Association just celebrated their 2015 Lacrosse Festival and also raised money for Play4TheCure, the signature fundraising event of The National Foundation for Cancer Research. Here are highlights of good sportsmanship, award ceremonies and all around good family fun. For the second year, New Hampshire's Youth Lacrosse Association has stepped up to Play4theCure as a Statewide organization. This signature program of the National Foundation for Cancer Research delivers 100% of the funds raised directly to work in funding cancer research in the lab. This year the project beneficiary is Dr. Dan Haber's Lab at Massachusetts General Hospital in Boston. While there is no charge for these photos, please consider a donation to NFCR, Play4theCure by going here: https://www.carii.com/fundraising/dan-haber-project Photos in these groups cover a cross section of games on Sunday (only) with particular emphasis on the Blue Storm Girls who - show more spirit and pure enthusiasm in helping to raise awareness and funds than any other team. Thank you Blue Storm Girls, you make my job easier. Shout out to Nashua as well - In my book you guys get a great sportsmanship award as well. Thank you all for making me feel welcome. Please give photo credit to Keith Spiro Photography if you share the images. The New Hampshire Youth Lacrosse Association's 2015 Lacrosse Festival gathered 6,000 kids, 300 teams in a 2 day Lacrosse Festival that raised money for Play4TheCure, the signature fundraising event of The National Foundation for Cancer Research. https://secure.nfcr.org/page/contribute/play4thecure Here is the short slideshow highlighting good sportsmanship and a great day of family fun. Celebrating a 40 year journey in research. Dr. Rakesh Jain tribute event in Cambridge brought people in from all over the globe. This slide show has been prepared by Keith Spiro Photography as a donation to the friends and colleagues of Dr. Rakesh Jain to further honor this friend of NFCR and make these images more widely available. A pleasant remembrance for those who were there and an insight into some of the activities for those who were not able to be there. Some image possibilities for use with the Southern Midcoast Maine Chamber annual meeting. Prolific author and kind soul Sy Montgomery read from her new book Soul of an Octopus at NH indie bookstore Gibsons. Just like Dr. Doolittle, all kinds of creatures take comfort in her company. Taste of Maine served over 500 people in three hours and they brought in over 1500 toys for all the children with distributions to the Santa Fund and Tedford Shelter. and this is why my family and I love what we do"said Candy Crooker Gregory owner of Taste of Maine restaurant in Woolwich. Now in their 38th season. Big shout out to the Taste of Maine Family, United Bikers of Maine, Tedford Shelter, Santa Fund and all the amazing volunteers . TEDx Boston hosted by Fidelity Center for Applied Technology. One full day of TED speakers covering a wide range of topics of interest to Boston and the world. TieCON is the largest gathering of Entrepreneurs in the world. TiECON East 2014 brought in entrepreneurs, mentors, investors and speakers from all over the world. Here are images from Day 1. Professional Bull Riding came to the 160th Topsham Maine Fair this year. This was the first time we had a rodeo and professional bull riders re-recreating the world of the Old West. Reminiscent of frontier days, the program was full of men and women, boys and girls without cellphones and tablets taking on a very physical activity of working with livestock. Refreshing and educational, it was great program and these images attempt to capture the spirit of the day. Thank you New England Rodeo for the refreshing physicality of your world. For more information on their work, you can contact Elias DaSilva at rodeonewengland@gmail.com prints & JPGS can be purchased for personal use. Please contact Keith for licensing for commercial use. Welcome to the Topsham Library Collection. As official library photographer, I have had the honor of capturing the joy of community that these photos represent. There is the Joy of series of art shows. The Music in March programs. Santa Reads and a whole host of family friendly activities. If you need an image to support a particular story or marketing effort to help the library, please contact me and I will be glad to help. Enjoy The Topsham Library - a community center for all. The Topsham Library just reopened after a week of being closed to the public while staff caught up on administrative tasks and contractors spruced up the interiors to get us all thinking about SPRING. This collection of photos was inspired by my conversation with library aide Linda Meadows - the only other person I have found who shares my love for cold- subfreezing cold, snowy, very snowy winter days. So while the inside of the building was sprucing up, I turned my photographer's eye toward images of winter around the exterior of our library. Dedicated to Linda Meadows. Here's tribute to the exterior of the Topsham Library in all its winter's glory. A year in photos by Keith Spiro Photo covering a very successful year at Train Riders NorthEast. See Wayne Davis and his team in a storybook perfect dream come true as the Downeaster expands into Freeport and Brunswick Maine. We had a great fundraiser for the Santa Fund held at the Taste of Maine in Woolwich. For bringing in a toy you received a great buffet meal for .99. There was a great turnout, with a lot of toys being donated to benefit not only the Santa Fund but also the Tedford Shelter. A special thanks goes out to those who helped with greeting toy givers and packing all the toys to Eric and Tina Black, Dwayne and Lorrie Swindler, Ernie Dibassio, Bryan and Teri Champagne,Keith Spiro as our photographer and all the employees of the Taste of Maine. This was very well done and the food was great. We also had some visitors from Franklin County UBM as Tim and Sue Fornier, Dee and Frank Robinson made the trip. Thanks for coming. And last but not least a big thank you to Candy Crooker- Gregory for hosting such a great event there. All the gifts go to help those in need at this time of the year. Thanks to all who helped or donated toys and had lunch and Merry Christmas to all. 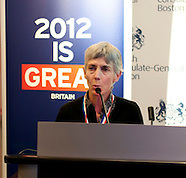 @UKinBoston hosted their Innovation Economies Conference at the MIT Media Lab on March 26, 2012. Keynote addresses from Governor Duval Patrick, UK Minister Mark Prisk and Media Lab Director Joi Ito were followed by a lively panel discussion on supportive innovation environments. This slideshow of the New Hampshire Youth Lacrosse Association's Lacrosse Festival makes a strong visual case for the relationship between US Lacrosse & The National Foundation for Cancer Research. NHYLA & Play4TheCure piloted a statewide program for the benefits of affiliation. United States Senator Kelly Ayotte sent a proclamation commending the efforts. Awareness, education, good sportsmanship and a family friendly fun time for all are clearly visible over the two day event. Fighting all cancers, through all sports and all ribbons makes good sense. Education and awareness are shared goals. Happy Birthday United States Marine Corps November 10, 1775. And, right behind it is Veterans Day. Thank you all for your service. It was a privilege and a pleasure over the years to be asked to cover events related to these two milestone days. Our friend Vern retired -or so he claims. Here friends and family gathered to celebrate. WEST http://www.westorg.org/about-west Advancing Women in the Business of Science & Technology. Keith Spiro Day in photos of WEST's Leadership Awards Event May 3, 2012. Breaking the Mold: with Boldness, Courage and Risk-Taking Any profit from photos purchased here will be donated to WEST to support further education and mentoring activities. For all other uses please contact Ilene Fischer at WEST. WEST's goal is to improve the leadership status of women in science and technology by inspiring them to achieve success in their organizations and create positive impact in their communities. The Economic Impact of Women on Boards explores the overwhelmingly positive effects of women on corporate boards. Congratulations to those companies that have GREATER THAN 20% women board members. The Women In Military Service For America Memorial (Women’s Memorial) is the only major national memorial honoring all women who have defended America throughout history. Compare image 3266 where there is just one female face to 125534's full group on the Maine Honor Flight trip day at the Washington DC memorial. There are many more who served than you might think. Help insure their stories are collected and told. Support the Women's Memorial. Register a veteran or encourage them to register here: https://womensmemorialstore.wufoo.com/forms/online-registration-and-donation-form/ FMI: https://www.womensmemorial.org/ or Maine State Ambassador for the Women in Military Service America Memorial mail to: joyasuncion@roadrunner.com The repository for the memorabilia of women who have served in or with the US Armed Forces from the American Revolution to the present time. Yolanda Fusco shared a friendship with my wife and I that transcended our age and stayed connected from the moment we met her on Monhegan Island off the Coast of Maine. As Elizabeth Moss Galleries opens her show YOLANDA FUSCO, MONHEGAN SUMMERS, we wished to share these images of her creative space on the Island (circa 2004-5). She remains forever in our heart and in our minds. For information on obtaining prints, please contact me.